Take full advantage of your stoppers with DBA Club Spec 4000 T3 brake rotors. 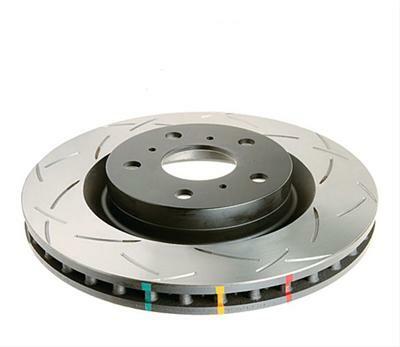 These rotors are full of features desired by the track enthusiast and weekend cruiser alike. DBA's exclusive XG150 high-carbon alloyed iron and TSP process allows each rotor to withstand extreme heat without the serious degradation found in other, lesser rotors. DBA's patented Kangaroo Paw ventilation provides awesome heat dissipation, and their T3 slot design dampens vibration for quiet, responsive braking and pedal feel. To keep these rotors looking as great as they perform, DBA applies a protective paint onto the non-friction areas, along with heat paint marks, so you can monitor peak breaking temperatures. Reign in all of that speed safely with DBA Club Spec 4000 T3 brake rotors. Rotor Outside Diameter (in): 13.779 in. Rotor Thickness (in): 1.102 in. Notes: Non-friction areas are painted black.